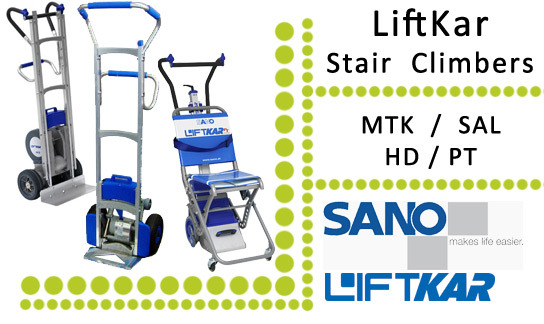 This stairclimber is ideal for transporting white goods, oxygen cylinders, crates, boxes and parcels. Constructed from aluminium, this stairclimber is lightweight and can easily accommodate winding stairs and narrow landings. This model in the Sano stair climber range is probably the fastest machine on the market today. This stair climber has a fixed handle behind the frame and a small folding handle at the top of the frame. With the handle in the folded position the stairclimber looks like an ordinary handtruck. In the upright position you are able to accommodate high loads. With the handle in forward position you have got more or less an ERGO. This handle shape and tall frame makes it ideal to support stacked crates or boxes. The stairclimber model shown on the left has a standard toeplate, other sized toeplates and accessories are available. An optional pistol grip is also available for this stairclimber at time of purchase.